Mr. O'Malley dolls were probably manufactured in the mid-1940s, at the height of "Barnaby's" popularity. I do not know if any of these dolls exist today. If you have one and would like to send me a photograph of it, I'll post the photograph here. 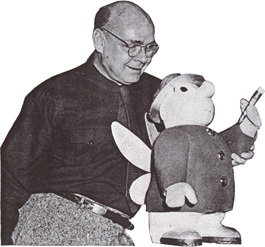 This photograph of Crockett Johnson and a Mr. O'Malley doll appears in the 1953 Brun Mael, the yearbook for Brown University's Pembroke College -- that year, Brun Mael adopted a "Barnaby" theme and dedicated the yearbook to Johnson. Their dedication reads, in part,"TO CROCKETT JOHNSON...whose whimsical pen gave life to Barnaby. To achieve such a happy blend of droll wisdom and high good humor is a considerable accomplishment. Mr. O'Malley and his entourage stand as undeniable proof that there is a place for fairy godfathers, not only in the magic realm of childhood, but in the considerably more mundane sphere of adulthood...Perhaps Crockett Johnson did not forsee Mr. O'Malley in the role of mentor to eight hundred college women, but he is just that in Brun Mael."